Ring of Honor has announced the signing of Rush, MLW changes main event for WrestleMania Week, Raw viewership, new title match at the Royal Rumble, updates on Chris Sabin and Flip Gordon & more. **This week’s Rewind-A-Raw is up on the site with Wai Ting and I reviewing the show from Memphis, discussing the switch from Braun Strowman to Finn Balor at the Royal Rumble, Bobby Lashley winning the Intercontinental title, and all the news from the past few days along with your feedback at the end of the show. **Wai Ting and I are back tonight with Rewind-A-SmackDown to review the show from Birmingham and go through today’s news and feedback. **On Wednesday morning, a new edition of the Double Shot will be out for members of the POST Wrestling Café. On this show, we will be reviewing the Nigel McGuinness documentary and special on Mean Gene Okerlund from the WWE Network and Wai will be reviewing the season premiere of Total Bellas. **Later this week, I’ll be a guest on the 2 Men and Their Mics podcast to chat the creation of POST Wrestling, the big wrestling stories already in 2019, All Elite Wrestling, the UK scene and more. **Ring of Honor announced Tuesday they have signed Rush to an exclusive contract. 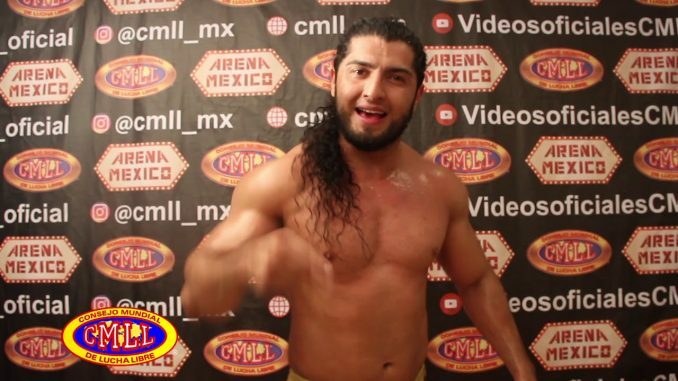 Rush works for CMLL, which has a working relationship with Ring of Honor, but Rush had been working for both ROH and MLW. The latter had announced a big match between Rush and LA Park for April 4th during WrestleMania week at the Melrose Ballroom, but that match is off due to Rush’s deal with Ring of Honor. MLW put out a statement and claimed Rush was pulled “due to the insistence of a third-party promoter” with MLW CEO Court Bauer adding that politics got in the way of the match taking place. MLW has announced that Pentagon Jr. will take the place of Rush and face LA Park on April 4th. We will have more on this story on Rewind-A-SmackDown tonight. **Monday’s episode of Raw did well with a 17% increase for their first week without football competition. The show averaged 2,722,000 viewers on the USA Network and was their highest number since Labor Day last September. The first hour averaged 2,775,000 viewers, grew in the second hour to 2,781,000 and then had a dip down to 2,610,000 viewers for the final hour featuring the fatal four-way match for the title shot at the Royal Rumble. To compare to last year, the first week without football competition in 2018 averaged 3,200,000 so they are down 15% year-over-year. **The major story from Raw was Finn Balor taking the spot of Braun Strowman at the Royal Rumble against Brock Lesnar for the Universal title. I was able to independently confirm that this wasn’t a last-minute decision regarding Braun Strowman’s elbow, and they had this angle planned for a while with the idea that Balor would be in the match. By looking at how Balor has been booked over the past month, it all adds up that the had a reason for him winning and even ending Drew McIntyre’s unbeaten streak. Dave Meltzer added on Wrestling Observer Radio that this was always the plan with Vince McMahon feeling Strowman should not be losing now. It is also true that Strowman has not been cleared yet following elbow surgery in December. **During the Moment of Bliss segment on Raw, it was announced the inaugural WWE women’s tag champions will be determined at the Elimination Chamber event on February 17th in Houston, Texas. There will be three teams from Raw and three from SmackDown participating in an Elimination Chamber match to become the champions. They are going with one set of champions instead of each brand having titles, but they have not announced if the champions will be exclusive to one brand. There was one prior tag team Elimination Chamber match at the 2015 event where the New Day defeated The Ascension, The Lucha Dragons, Tyson Kidd and Cesaro, The Prime Time Players, and Los Matadores. **205 Live returns to a live format tonight at 10 pm Eastern and will feature an open challenge from Buddy Murphy. **The season premiere of Total Bellas averaged 505,000 viewers on Sunday night. The average viewership for the third season last year was 634,000, so this was well below that figure and only one episode in the last season did as low a number. It’s well above the average for the most recent season of Total Divas that averaged 392,000. **Ring of Honor has provided a further update regarding the knee injuries to Chris Sabin and Flip Gordon. Both are undergoing MRIs this week to determine the extent of their injuries, but it is believed Sabin suffered another torn ACL in his right knee, which is so unfortunate. Sabin suffered a torn ACL and MCL in 2011 in his right knee and was out for a year. He returned in 2012 and two months later tore the ACL in his left knee and was out another 11 months. The promotion stated that Gordon is believed to have suffered an MCL sprain and will out at least four weeks. **No viewership figure has been reported for Impact Wrestling’s debut on the Pursuit Channel from this past Friday. On the Showbuzz Daily website, which tracks daily cable and network figures, the show did not finish in the top 150 cable programs, which are ranked by the 18-49 demographic. The lowest ranked shows registered a 0.04 in the 18-49 demo. The site was inundated with requests for Impact Wrestling’s number and the site stated, “Because so many people have asked, note that we have no ratings at all for the Pursuit service, including for Impact Wrestling.” The Pursuit Channel began subscribing to the Neilsen service in January 2018. On the Twitch simulcast, I didn’t monitor the live viewership the entire show but it hovered around 10-11,000 viewers and doesn’t include those watching later on the streaming service. **Due to the knee injury he suffered on Sunday at the Ring of Honor event in Concord, Flip Gordon is off this Friday’s Pro Wrestling Guerilla card. Gordon was scheduled to face Bandido and will be replaced by ACH. **The WWE stock closed at $81.17 on Tuesday. **New Japan World has announced there will be English commentary for all seven cards in February. The shows will be the New Beginning in Sapporo on February 2nd, New Beginning in Sapporo Night 2 on February 3rd, the Road to the New Beginning card in Osaka on February 9th, New Beginning in Osaka (Hiroshi Tanahashi vs. Jay White) on February 11th, New Japan Road (Takashi Iizuka’s retirement match) on February 21st at Korakuen Hall, and the Honor Rising cards on February 22nd and 23rd from Korakuen Hall. **Shane Strickland announced Tuesday that he officially a free agent. **ICW out of Scotland has announced that Kay Lee Ray will be defending her ICW women’s title against Little Miss Roxxy on February 3rd in Glasgow at The Garage. Ray just appeared at the NXT UK TakeOver card this past Saturday in Blackpool, England. **Viper lost both the SWA world title and the EVE International title to Utami Hayashashita at Stardom’s Korakuen Hall show on Monday. Viper has been rumored to be joining the WWE but that has not been announced yet. Viper competed in the Mae Young Classic in 2017 as Piper Niven. The top matches at Monday’s card featured Kagetsu retaining the World of Stardom title over Jungle Kyona and Momo Watanabe defeating Tam Nakano to retain the Wonder of Stardom title. **Ring of Honor has announced the 12 teams that will be taking part in the Tag Wars tournament that will take place January 24th in Dallas, January 25th in Houston, and wrap up January 26th in San Antonio with the shows streaming on Honor Club. The teams will consist of: Jay Lethal and Jonathan Gresham, PCO and Brody King, Juice Robinson and David Finlay, Vinny Marseglia and TK O’Ryan, Colt Cabana and Flip Gordon (Gordon will likely be replaced), Coast to Coast, Tracy Williams and Mark Haskins, Beer City Bruiser and Brian Milonas, Kenny King and TBA, Eli Isom and Cheeseburger, The Boys, and Karl Fredericks and Alex Coughlin from New Japan’s L.A. Dojo. The winners of the tournament will challenge The Briscoe Brothers at the 17th-Anniversary pay-per-view on March 15th in Las Vegas. **The clip from Raw with the production assistant walking into Alexa Bliss’ dressing room as she was changing has over 2.1 million views on YouTube. The only clip with more views is Braun Strowman tipping the limousine, which always leads to strong digital numbers when he does a crazy stunt. In 2016, they did a similar angle where Eva Marie faked a wardrobe malfunction to get out of a match on SmackDown. Because of the thumbnail image they chose from the clip, they produced two separate videos with one doing 51 million views and the other 37 million. **WWE Network News is reporting that approximately 30 episodes of WWF Superstars from 1992 will be added to the WWE Network next Monday. The site reports that the episodes will begin from April 1992 after they stopped branding the show as “Superstars of Wrestling”, which was trademarked by a wrestling promoter of Wisconsin named Albert Patterson in 1990 and still holds the trademark. **MLW has added a tag match for their SuperFight card on February 2nd in Philadelphia at the 2300 Arena. Tommy Dreamer and Brian Pillman Jr. will each select a mystery partner and face off on the show. This card is headlined by Low Ki defending the MLW title against Tom Lawlor. Lawlor was on Ariel Helwani’s MMA Show on Monday and said he recently cleared after breaking his hand during the Golden Boy MMA fight with Deron Winn in November but started sparring and still had problems with the hand. **WrestlePro has announced a tag match with Colt Cabana and Santino Marella facing the Heavenly Bodies team of Desirable Dustin and Gigolo Justin Corino. This match will take place Wednesday, April 3rd in Rahway, New Jersey at the Recreation Center during WrestleMania week. **Smash Wrestling’s first card of 2019 will be on Sunday, January 27th from the Phoenix Concert Theatre in Toronto at 3 pm. The show will feature Jimmy Havoc vs. Scotty O’Shea, Tarik vs. Kevin Bennett for the Smash championship, Rey Horus vs. Façade vs. Matt Cross, Sebastian Suave vs. Jay Freddie, Tyson Dux and Brent Banks vs. Halal Beefcake for the Smash tag titles, Kill/Screen vs. Fight or Flight vs. Well Oiled Machines, and Puf vs. John Greed. **Bobby Lashley’s Intercontinental title win on Monday was his first WWE championship since June 2007 when he won the ECW title for the second time. He also held the United States title once in 2006. **Capitol Wrestling out of New Jersey has been producing some of the best digital content among the independent scene. Their editor is Zane Decker and here is one of their latest videos they have released. Their next card is Saturday, February 2nd in Hoboken and takes place at 301 Garden Street at 8 pm. The promotion has existing deals with Fite TV and recently announced a deal with the Global Wrestling Network. **Chinlock Wrestling out of Kingston, Ontario will be making an announcement Friday about a big charity event they will be running later this year. **UFC fighter Jennifer Maia has accepted a six-month suspension from USADA after testing positive for several banned substances that were from a contaminated dietary supplement. Maia was tested out-of-competition on August 16th and her test came back positive for several substances that are classified under the class of Diuretics and Masking Agents. Maia provided the dietary supplement she took, which she had disclosed prior, and they discovered the unlabelled substances in the supplement. Her suspension is retroactive to August 31st and will be eligible to fight in March. Maia fought for Invicta FC and made her UFC debut last July where she was defeated by Liz Carmouche by unanimous decision after winning her previous six fights outside the promotion. **Damon Martin reported that Kyle Stewart is going to step in to fight Chance Rencountre this Saturday at the UFC on ESPN+ card in Brooklyn, New York. Dwight Grant was scheduled to take the spot of the injured Randy Brown, but the New York State Athletic Commission did not license Grant. Stewart is a 29-year old with an 11-1 record. He won on Dana White’s Tuesday Night Contender Series in 2017 but wasn’t offered a contract. Since then, he has gone 3-1 and last fought in November where he defeated Braden Smith at LFA 53. Martin & Benno are joined by Joe Lemon from Spotlight on The Indy Corner to review the first-ever NXT UK TakeOver from Blackpool, England. They talk their favorite moments from the show, what worked and what didn’t. John Pollock and Wai Ting are joined by a number of callers discussing All Elite Wrestling, Tony Khan, Saturday’s NXT UK TakeOver, WWE’s Worlds Collide Tournament, and MJfromNJ tells us how we did in our Elite-themed Likely/Unlikely game. John Pollock, Wai Ting, and special guest Brent Chittenden review the sixth Marvel Cinematic Universe film, The Avengers (2012). We discuss the culmination of Marvel’s Phase One with a look back at its most ambitious crossover at the time, helmed by writer/director Joss Whedon. upNXT 1/10/19: Johnny Want the Smoke? Braden Herrington & Davie Portman chat this week’s episode of NXT featuring Nikki Cross vs. Bianca Belair and EC3 vs. Adam Cole, and a fantastic opening segment between Gargano, Ricochet, Ciampa & Black. Davie brings back his review of 205 Live. Martin & Benno are back to review Progress Chapter 82: Unboxing Live! 3 (Pete Dunne vs. Tyler Bate) and preview this weekend’s NXT UK TakeOver: Blackpool show.